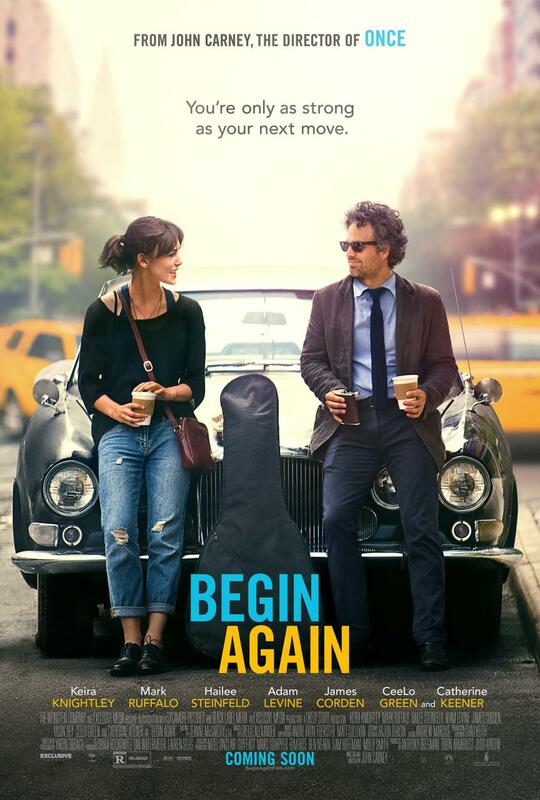 “Begin Again” sounded like a good movie, and a pretty good move in general, so I tuned into Writer/Director John Carney’s (”Once”) second feature film. Dan (Mark Ruffalo from “Now You See Me“) is a once-great A&R guy with no A or R. He has not signed an artist for a decade, so his label threw him out. Dan also left his wife a year ago, so things are really looking down. Every piece of new music he hears sounds old and tired and worthless – a kind of audio metaphor for his life. He winds up guzzling whisky at an open mic night, and hears Greta (Keira Knightley from “Seeking a Friend for the End of the World”) sing her new song. The melody nudges him, and the voice intrigues him while the lyrics seal the deal. The crowd gives her a polite applause, as all they heard was a whiny girl strumming an acoustic guitar. He heard something special, and unique, and above all – he heard potential. Dan could hear the rest of the musicians that should be there to accompany her as he created the arrangement in his head to make the song sing. It’s like the way I re-write a movie in my head as I see it going off-track. When Dave (Adam Levine from Maroon 5), Greta’s boyfriend of five years, gets signed to a record deal and a tour, he sees less potential in her. They wrote songs together, but when his star takes off she is left holding a pencil and staring at a blank piece of paper. It’s a very pat premise where opportunity and preparedness meet. With no money for studio time, Dan takes to the streets of New York City and produces an album on the cheap. The plot also parallels Carney’s first movie where a guy and a girl get together to lay down some songs. There is something magic about making music with someone and falling in love with the music, the person and the process. At the end of the day/movie, at least the music will still be there. I really wanted to love this movie. It does not have the magic of “Once” with the awkward moments between the leads as they fall in love along with the music they create. Despite Carney’s effort to make it seem indie, this movie was much slicker with Ruffalo and Knightley being the darling A-listers they are. You never really connect with them, and they connect over the music but not much else. That might have been the point, or just a lack of chemistry. This is a good date movie, and the songs are great, and there are some wonderful moments here. I liked this movie, I just did not fall in love with it, and for that reason I must give it 3 1/2 stars out of 5. When you hear the music you may sing, but when it moves you, you will dance, and I wanted to dance.